Hoi An Cooking School - Quick and Easy Vietnamese Recipes for Home! Our visit to Hoi An in central Vietnam was woefully lacking in activities. Not because we didn’t want to get out and see/do things, but because Hoi An was hit by typhoon Damrey the day after we arrived. Thankfully, we managed to see Hoi An Lantern Festival before the rains started. But for the next few days, the ancient town was completely flooded. Locals were actually offering boat rides to tourists starting at the edge of the flood zone. On one of the rainiest days, we decided on a perfect indoor activity for visitors to Vietnam – a Hoi An cooking school. Vietnamese cuisine is possibly our absolute favourite in the world, even more so after we visited. A Vietnamese cooking class is high on the list of must-dos for many visitors to Vietnam. We learned how to make quick and easy, delicious and authentic Vietnamese food that anyone could cook at home. This is part of our Vietnam 3 Week Itinerary post. Click here to see the whole Vietnam 3 Week Itinerary. You can choose from many a Hoi An cooking school, ranging from high end to low end. High end usually includes a boat ride and a trip to the market and costs around $25 per person. Due to the rains, we decided not to spend that much and went for a cheaper version. Our Hoi An cooking school took place at one of our favourite restaurants – Cafe 43. Located down a back street set back from the river, Cafe 43 has a wonderful local menu, top-notch service and usually, local fresh beer (Bia Hoi) at VND 3000 ($0.13). They also have a little orange and white cat, who is crazy affectionate and Tom promptly decided to name him Mr Lantern (Tom has a tendency to give weird names to animals). You’d like to have a more classical cooking school experience? Then check out this great Cooking School which also involves a trip to a farm and a herbal massage! Having eaten there a number of times, we enquired about the cooking school at the restaurant. The way it works is that you can choose your favourite menu dishes from a list, and they will show you how to cook them for the price of USD8 per person, plus the cost of the menu item itself. Many other restaurants in Hoi An also offer this option for doing a cooking school, so if you find a favourite restaurant there, you may also find that you can cook your favourite menu items! We decided to create two dishes at our Hoi An cooking school experience – chicken with chilli and lemongrass, and pork in clay pot. For the first time, we have created an instructional recipe video, showing step by step what we cooked! The video is about 9 minutes long and you can watch it below. The recipes we learned for our Hoi An cooking school are also written here for your convenience. This dish is very light and contains enough lemongrass that the citrus flavour really shines through, with the heat of the chilli giving it an additional delicious warmth. It would be great as a lunch or light evening meal. You could serve also with rice. This portion size will serve one, if you are serving more people then multiply up. Mix the chicken together in a bowl with the garlic and shallots, seasoning and sugar until all the pieces are mixed together. Heat the oil in a frying pan or wok. Add the chicken and cook over a medium/high heat for 1-2 minutes. Add all of the remaining ingredients and cook until the lemongrass is browned (5-10 minutes). Serve on a plate whilst still hot, with rice if you wish. This recipe has a greater depth of flavour than the chicken recipe above. Traditionally, it should be cooked in a clay pot, however, if you have a small casserole dish or even a saucepan, it can probably work just as well. Again, this portion size will serve one person. Mix the pork meat together with the ginger, garlic and shallots, black pepper, salt and sugar. Heat 2 teaspoons of oil in the clay pot. Add the pork, and stir over the heat until it is medium cooked. Add all other ingredients to the pot except the spring onions. Cook for 5-10 minutes until the onions start to soften. Cover the pot and cook for 5 more minutes. Add the sesame seeds and the spring onions. Cover again and cook for another 5 minutes, and then serve directly from the clay pot. Are you in Thailand and in search of a good cooking school? Then check out our post about the great Thai Akha Cooking School in Chiang Mai! We cannot wait to try these recipes again ourselves! Both were completely delicious and very easy to prepare and cook. Hoi An cooking school is highly recommended by us as a way to recreate your favourite Vietnamese dishes yourself at home! Do you enjoy cooking schools around the world? Then check out all the other posts about cooking schools we wrote! Do you have any favourite recipes or cooking school experiences to share? Let us know in the comments below! DISCLAIMER: Please note that this post may contain affiliate links. If you use these links to make a purchase or a booking, we will receive a small commission from the vendor at absolutely no cost to you. 10 More Things You Didn’t Know About #TravelTribe! Don’t worry if they don’t look as good, I’m sure they will definitely taste as good 🙂 We cooked the lemongrass chill chicken again in a little apartment in Thailand and it still tasted awesome! Thank you very much for your comment! Oh wow, I can’t wait to try these! Oh yum! 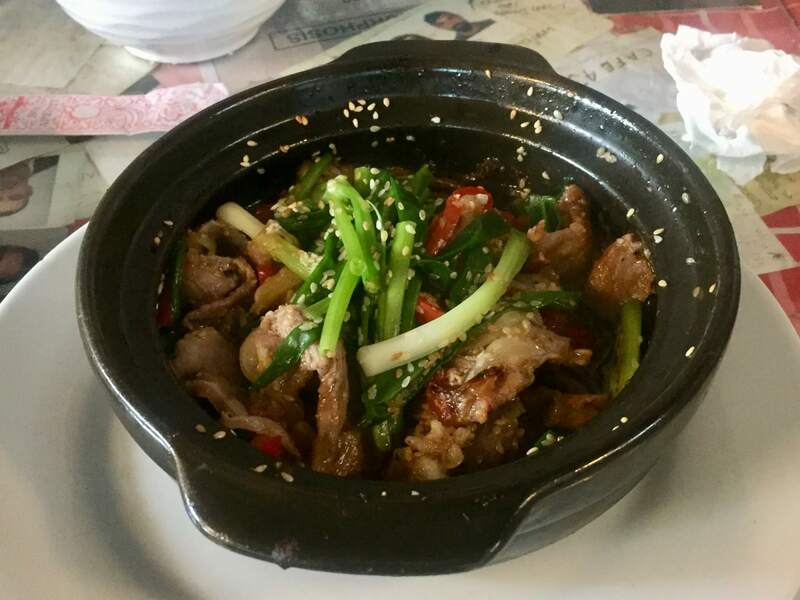 I want to try the pork in claypot! It all looks delicious and so fun to try making new recipes! Hi Stef, we are also looking forward to try this recipe again as we totally loved it and it is so easy to prepare 🙂 Thank you very much for your comment.